The cockpit offers plenty of seating room for friends and family, and the swim platform is big enough for two or three adults to sit on side by side while getting on their gear. The helm station is well situated with all the controls and gauges in handy, easy to reach places with good room left over for additional electronics. UNDERWATER TRANSOM & SIDE LIGHTS! 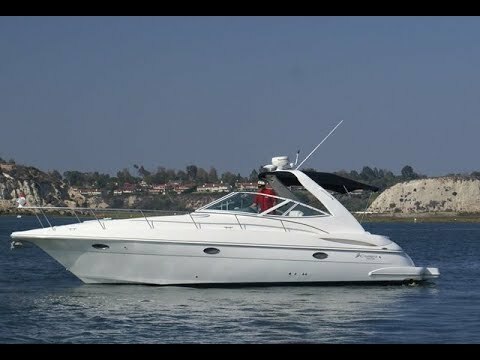 The Cruisers 340 Express offers unbeatable performance in an expertly designed, luxurious cruising package. Her interior accommodations will sleep five comfortably. The forward stateroom features a large double bed with easy access, and the stateroom can be closed off from the salon by a privacy curtain or an optional bulkhead and door. Aft, owners can select either a fixed double berth, maximizing overnight accommodations for guests, or an alternate layout with a circular settee that can also be converted to a double berth. With the settee layout, this area can effectively lengthen the salon into one wide open living space or, with the privacy curtain, it can serve as a comfortable mid cabin. The facing dinette - or available crescent-shaped, convertible dinette - to starboard provides an additional berth. Located just to port of the companionway is a full-service galley with all the amenities, including a large refrigerator/freezer, microwave and double-burner electric stove. For additional on board convenience while cruising or living aboard, the 340 also provides a feature unusual for a boat in this class: a spacious head with a large, separate shower stall and full standing headroom. Above decks, the 340 has a generous cockpit seating arrangement that is ideal for dockside or on-the-water entertaining. She also features a wet bar, cockpit shower and available cockpit refrigerator or ice maker - perfect for fun-filled summer afternoons with family and friends. A custom-fitted enclosure will keep everyone protected from the hot sun or inclement weather. And, the 340 Express boasts a wide variety of power options, as she is available with either stern drive or inboard power. BE SURE TO WATCH ALL OF THE VIDEOS! Yacht brokers all use the same MLS internet sites. What matters is which company provides the valuable services to sell your boat. We use a full time professional CPYB broker, use professional quality photos & brochures, Infrared photography, pre-inspects the vessel and videos the boat. We even offer "Underway Videos". 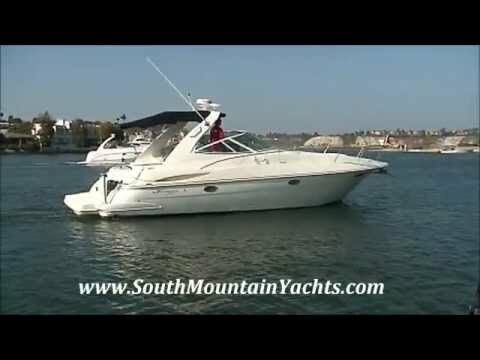 LIST TODAY WITH SOUTH MOUNTAIN YACHTS!